Washington Plaza Harnesses the Power of the SunBarnum & Celillo Electric, Inc.
Barnum & Celillo Electric, Inc. is always looking for opportunities to contribute to our local community, whether it is through community service, charitable donations, or environmental improvements. When Deacon Corp. entrusted Barnum & Celillo Electric, Inc. to bring the City of Sacramento even closer to its goal of truly becoming the “Emerald City”, we jumped at the opportunity. The City of Sacramento, with assistance from the federal government, is rebuilding government subsidized housing throughout the city. 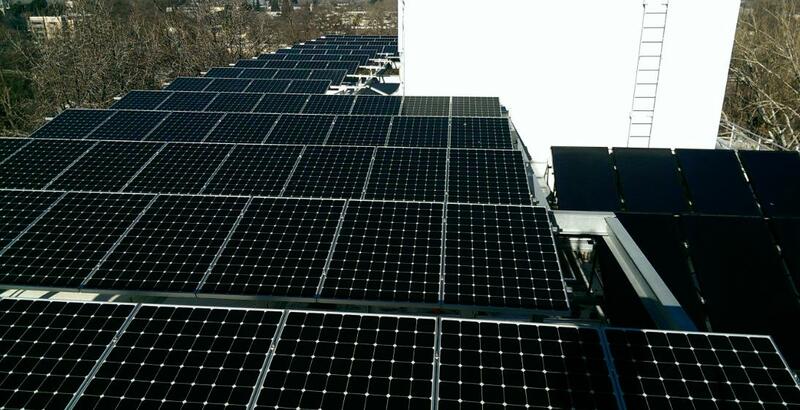 Perched atop Washington Plaza, a multifamily residential high rise in downtown Sacramento stands a new 80 kilowatt solar system which easily harnesses the suns endless power supply, converting it to useable electricity for the buildings occupants. Barnum & Celillo Electric, Inc. is proud to have been the installer and technical advisor for this new photovoltaic system. This solar system coupled with the many environmentally friendly and energy efficient improvements to these facilities are helping to make Sacramento one of the country’s leaders in renewable energy!